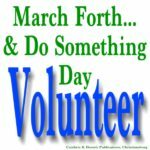 March is such a good, forceful, energetic verb (and the name of the month), so what better month to focus on volunteerism. March 13th is Good Samaritan Day, although we tend to celebrate things by the week, by the month, and by the year, so we would like to believe that this particular celebration lasts all year. It is one thing to be kind to those we know; it is something entirely different when we are kind to strangers who then become friends. We believe that we benefit and our communities benefit when we all volunteer. In an effort to make it a bit easier, we have listed some of the volunteer opportunities available in Christiansburg, Blacksburg, and Montgomery County. RSVP (Retired Senior Volunteer Program)–lots of volunteer activities for folks 55 and older! Volunteer Match.Org–a clearing house full of all sorts of opportunities, from working with International Students to being a child advocate through CASA to helping to promote sustainability. Volunteer NRV — a listing sponsored by the United Way of the New River Valley, from helping out with Meals on Wheels to being a bus monitor to working as a docent at one of the museums to being a dog walker for the Montgomery County Animal Shelter and the Humane Society of Montgomery County.